This baked orzo is the best way to prepare these tiny noodles. 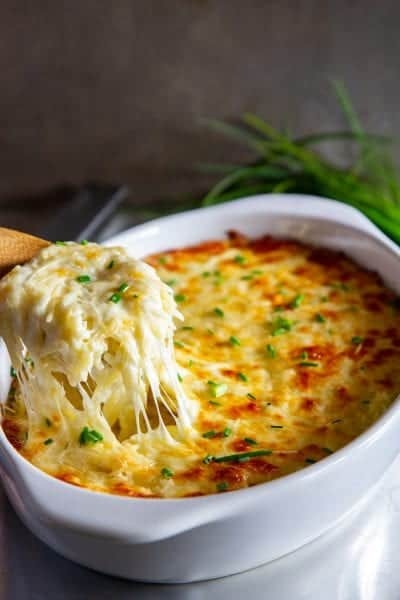 It's perfectly cheesy and so rich - everyone will love it! Heat the heavy cream in a saucepan over medium-high heat. Add in the grated garlic. Once the cream is hot, mix in the shredded Parmesan cheese. Cook the orzo according to the package, making sure to salt the pasta water. Once cooked, drain the water out. Add the hot cheesy cream into the pot of pasta and stir to combine. Place the pasta in a buttered 9 x 13 inch baking dish. Shred the mozzarella and sprinkle 1 cup over the orzo along with 1/2 cup of shredded Parmesan. Bake at 350 degrees Fahrenheit for 15 minutes or until the cheese becomes golden brown.